ROCKVILLE CENTRE, NEW YORK – January 31, 2019 – The Vatican announced today that Pope Francis has appointed an auxiliary bishop of the Diocese of Rockville Centre, Most Reverend Robert J. Brennan, as the 12th Bishop of the Diocese of Columbus (Ohio). The appointment was publicized in Washington, January 31, 2019 by Archbishop Christophe Pierre, Apostolic Nuncio to the United States. 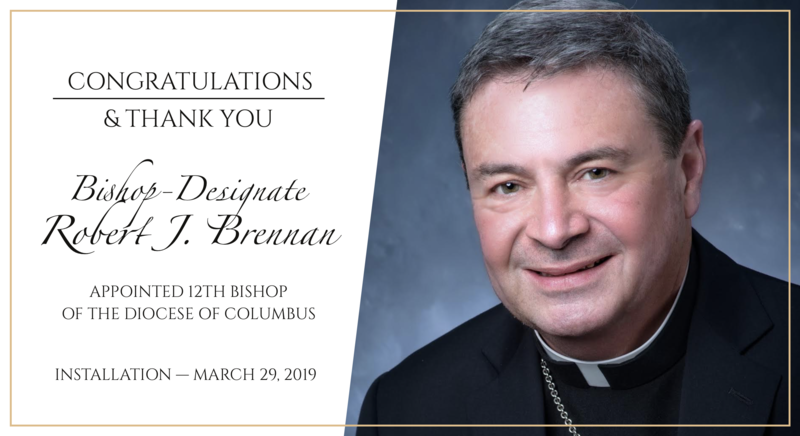 Bishop-designate Brennan will be introduced to the Diocese of Columbus at a news conference at the Diocese of Columbus Catholic Center, 197 E. Gay Street, Columbus, Ohio today at 10 AM EST.